If you’ve listened to or read any of the player commentary about Aether Magic — like the player quotes on the Kickstarter page, or this succinct review on BGG — you will see a lot of references to player interaction, bidding/bartering, engagement, etc. This interactive style of play was the main driver for this game design, and was always our touch-point to come back to as the game went through its year-long development process, once signed by Happy Mitten Games. 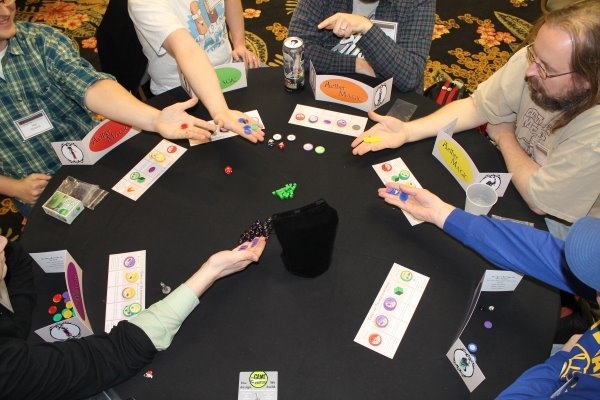 Engaging player interaction, gateway-style accessibility, and allowing players to make clever plays are three of the pillars that the Happy Mitten team continued to stress throughout that process. In choosing a very familiar, comfortable theme like “magi casting spells,” they knew they would be able to get an artist, such as Jacqui Davis, to knock it out of the park (and as you can see, she definitely did! ), but that it would also allow these mechanics to shine through. On a player’s turn, they will be drawing 2 new Aether chips from a draw bag. 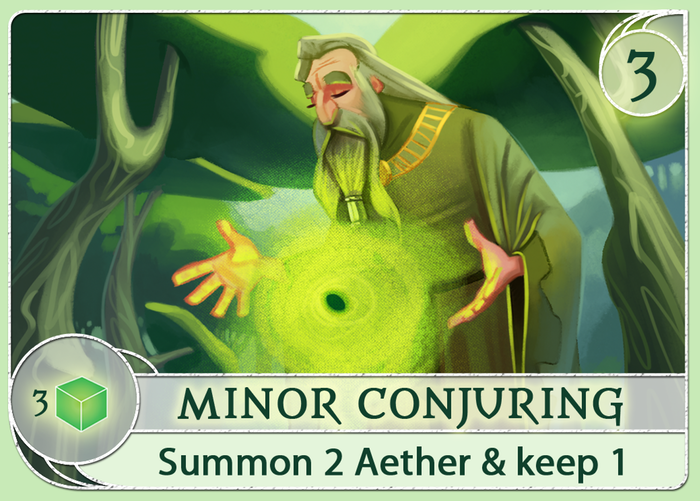 There are 3 different kinds of Aether, and each one generates its type of Element for casting spells. The Aether never goes away, so once you’ve added it to your stockpile, it will always generate a new Element each turn. 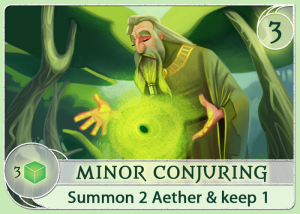 After the player draws the 2 new Aether, they keep 1 and put the other up for bid to the other players. The player is encouraged to explain what they are looking for from the other players … whether it’s certain color Runes or Elements or a combination. Then all of the other players give a simultaneous bid, and the current player chooses one player to win the bid, and they exchange the Aether chip for whatever was offered. [cryout-pullquote align=”left|center|right” textalign=”left|center|right” width=”33%”]what really makes this interesting is the Runes … this little bit of an unbalanced value[/cryout-pullquote]While it’s subtle, what really makes this interesting, is the Runes: At the start of the game, you begin with your own “currency” — the Runes of your own color/symbol — and they have no value to you at all. They are, however, sought after by all of the rest of the players, because during spell-casting, you can trade-in any 2 unique Runes (this means 2 different colors) from any of the other players for any 1 Element. So, while gaining Runes from another player is a good first step, it really doesn’t matter until you get Runes from a second other player as well. This little bit of an unbalanced value really drives a LOT of why the bidding becomes so engaging for all players. I’ve seen some players win a bid by offering a single Rune that the current player could use to trade in for an Element they needed, while other players were offering multiple Runes or Elements that didn’t matter to the current player at the moment. Then layer on top of this the more immediate value of the Elements and which spells a player has in their hand that could be immediately cast if they get the right combination of things … and then the effects of that spell could allow the player to do 2 or 3 more things that the other players did not suspect (I’ll flesh that out a bit more in a future post giving the player tools to do clever things) … and you might start to see how that conversation when offering the Aether at the start of your turn gives you some pretty cool moments. Make sure the other players know enough to offer up what you’re really after, but not enough to fully know the plan you’re trying to act on! 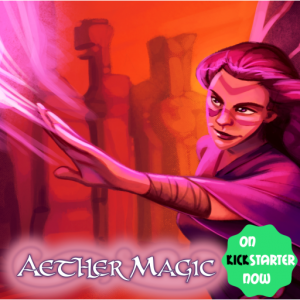 So, while it’s not really a “everyone shouting around the table” type game (like The Resistance), in Aether Magic, players are always engaged and talking to each other, paying attention to what each other has for Aether and Elements, and what the public Spells might cause to happen. It’s the magic sauce that makes the whole thing work. Sounds like a really fun mechanic, I can’t wait to try it! Thanks, Gino! Initially, it was one of those “what if …” type things to try and I was surprised at how the players responded. But, once I had that part of it down, it became the focus of the game.